I have always had a soft spot for the C-47, the military version of the DC3. At the airshow they offered semi-affordable rides in the venerable old birds. Not really worth it for me, I’ve ridden on them so many times before. 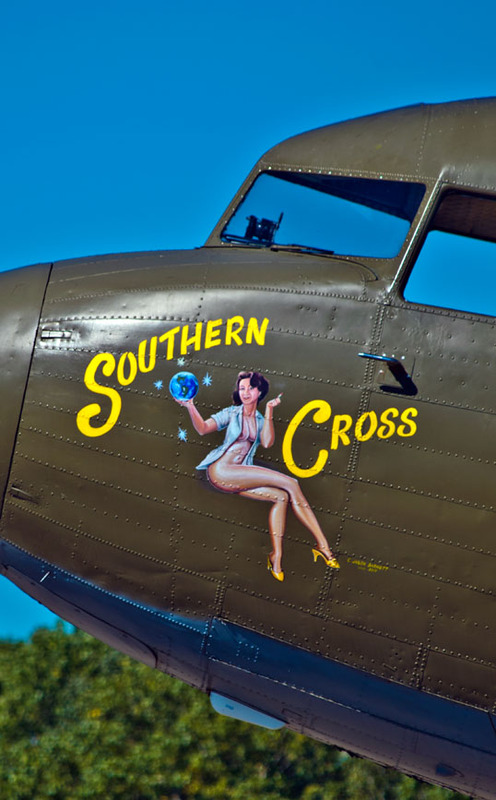 This entry was posted in Photography and tagged airplane, c-47, cargo, Dallas, DC3, nose art, Photography, Texas, vintage, wwii. Bookmark the permalink. Interesting positioning of the world globe, it appears to be the Americas, yet the Southern Cross is distinctly Australian. Nice concurrence? I guess (cough) I am focusing on the wrong thing. Thanks for that info, the aircraft certainly has managed a long and useful life, a living piece of history.